Is An SSB Marine Radio Installation Worth Having on Your Sailboat? SSB marine radio is the bluewater sailors' favourite method of long-range communication. Once you've got the equipment installed - sadly not an inconsequential investment - all calls are free. SSB (Single Sideband) radio has a much greater range than a VHF (Very High Frequency) radio's typical 35 to 50 nautical miles. Medium Frequency (MF) SSB radio has a range of around 400 nautical miles, but High Frequency (HF) will reach out for several thousand. Clearly the power required to achieve this range is considerably more than for a VHF radio; SSB marine radio sets typically draw a peak current of around 25A when transmitting. 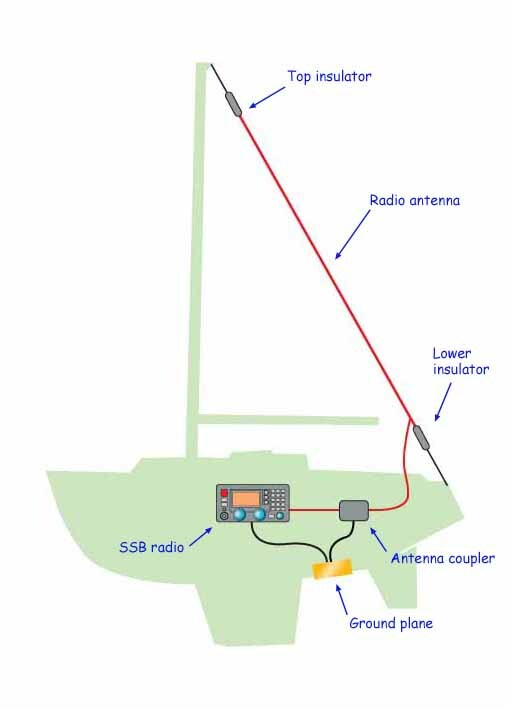 An automatic antenna tuner - SSB radios transmit on a wide range of frequencies which affects the impedance of the fixed-length antenna, which in turn affects the performance of the transmitter. An automatic antenna tuner, sometimes referred to as a coupler, matches the antenna to the output from the SSB. Manual tuners are available, and are cheaper too, but require constant readjustment with frequency changes, making the radio much more difficult to operate as a result. As with all modern VHF radios, top of the range SSB radio sets have DSC functionality built in, but if you want to use it together with the capability of being able to transmit on all marine MF/HF/VHF frequencies from a yacht then you need a GMDSS Long Range Certificate. Such an SSB set, interfaced with a GPS (for DSC capability) and a laptop computer provides further functionality - access to weather fax, and email communication. There are around ninety weather stations around the world which regularly broadcast meteorological maps on HF SSB frequencies. With one of the weatherfax software programmes - Mscan Meteo or ICS Weather Fax6 for example - loaded into your computer, a weather map specific to your area of interest can be downloaded, often together with an associated forecast. It can then be viewed on screen, or sent to a printer if you have one, for detailed analysis. Just one more electronic gizmo - a radio modem - to install and then, once you've enlisted with an SSB email service provider, you can send and receive emails wherever you are. Most SSB email service providers charge an annual subscription, so there are no line-time or by-the-bit (minutes used) charges as with mobile phone or satellite systems. There are limits on usage though. For example, subscribers to www.sailmail.com, one of the most popular SSB ESP's are required to limit their use of the SailMail stations to a running average of 90 minutes per week. File attachments can't be sent with outgoing emails and only certain attachments - such as weather data in .grib file format - can be received. Licensed HAM Radio Operators can sign-up to the Winlink 2000 system which is completely free to use, but unlike sailmail, does not allow business transactions to be carried out over their network. Next: SSB Marine Radio or VHF Marine Radio?